$mod.Type = 0 #for the enum value "SPWebConfigModification.SPWebConfigModificationType.EnsureChildNode"
$assembly = "Contoso.SP, Version=1.0.0.0, Culture=neutral, PublicKeyToken=20c0327f8b01d979"
Allright, how can we apply changes in the whole farm? Ryan Dennis uses $app.Parent.Apply.. Rajkamal says we have to run service.Apply (if it would be in C#). To Get Service we can use generics in Powershell. Keith Dahlby writes about SPWebService.ContentService. I encountered a problem adding the first connection string by this script. It just didn’t work. The solution is to add the parent element “connectionStrings”. 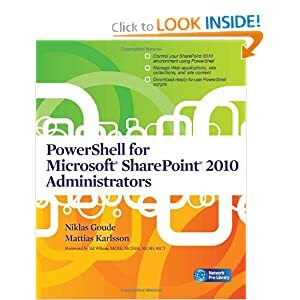 By the way, I found it in PowerShell for Microsoft SharePoint 2010 Administrators by Niklas Goude and Mattias Karlsson. In the example no error handling is provided for the sake of brevity. It is much simpler, as simple as unbelievable :). Are there some problems with NavBarLinks? Edit: I found one shortcoming with NavBarLink: you can’t use resources from cmscore like $Resources:cmscore,List_Pages_UrlName;. To solve we can create a copy of this string in our custom resource file: $Resources:Takana,List_Pages_UrlName;. To add items to a list in bulk, or remove them in bulk. Well to do that you can use SPLinq, Server Object Model and … web.ProcessBatchData, which is the most effective. I did an experiment today. I created 1000 tasks in my task list three times and removed all items in three different ways and took time. var title = "task "
This result confirms another comparision. See even advantages and disadvantages of linq2sp vs caml. The time includes even the instantiation of the SPSite and SPWeb objects and getting of task ids to remove, this to get a fair comparision with SPLinq, where this instantiation is implicit (within the context). 1. SPLinq method left one list item after removing 10 000 batch (task 08787) and three items while removing 20 000 batch (task 07550, task 12042, task 19663). Why? 2. I opened the list sometimes and I found that deleting of items took very long time in the beginning, and then it became faster and faster. I suppose the whole data context was saved after every submission. I am wondering if it would be different if I’d set ObjectTrackingEnabled to false, which is true by default. See the whole blog entry for the code I ran to compare these three ways to remove list items. For more sophisticated warmups Wahid Salemi provided an interisting script to warm up your Sharepoint. Use this PowerShell script warm up a site. This PowerShell script uses net.webclient class to download the page and trigger warmup. This example warms up http://intranet site.